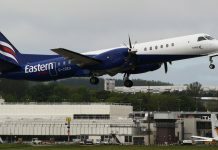 Bombardier capped a series of CS100 tests at London City Airport (LCY) with a nonstop transatlantic flight to New York JFK on March 25, demonstrating the range capability of the smallest CSeries airliner from the airport closest to central London. CS100 flight-test aircraft FTV2 completed eight flights from LCY over two days on Mach 22-23, to validate the aircraft’s ability to operate into the airport, with its 5.5-degree approach and short runway. The flights, some with Transport Canada and European Aviation Safety Agency pilots on board, followed “hundreds” of landings in tests at Wichita and Salina, Kansas, Bombardier CSeries-VP and GM Rob Dewar said.